Whether you are a backwoods culinary artist or a trail-blazing, Mountain House munching machine, Jetboil has a new stove that will awaken the gear junkie in all of us. Jetboil has been leading the outdoor industry in self-contained, rapid boiling stove systems for years. These stoves feature an integrated burner and pot system that pack down with room for a fuel canister inside of the pot. MSR has recently edged its way into the rapid-boil market with its new, totally rad Wind Burner. Jetboil and the MSR Wind Burner are killer when it comes to heating water. They both have boil times of just over two minutes for a half liter of water and are as efficient as a fox in a hen-house. Jetboil has recently upped their game yet again with a new and improved stove valve. This new valve allows for uncompromised simmer control, a feature sorely missed in rapid boil stove systems until now. The new valve allows for performance down to 20oF, a big improvement from previous models. Jetboil has introduced two new stoves featuring the valve: the 1.8L Sumo and its little brother, the 1L MiniMo (pot volume being the only difference between the two). The Jetboil stove has long been a center piece of my camp kitchen in the backcountry, the front country, and the car country. It is very stable and is convenient hell. The neoprene wrapped, lidded pot attaches to the burner which then screws straight into a canister of fuel. What this means to you is that you can literally hike with this in your hand while boiling water (I’ve seen it done). If you geek out over super lightweight multifunctional gear, this stove system is for you. It’s lightweight, packs down into itself, and has a lid with a pour/sipping spout and a strainer. Thanks to the pot’s fold out handle, it also doubles as tankard for post-hike, celebratory beers. 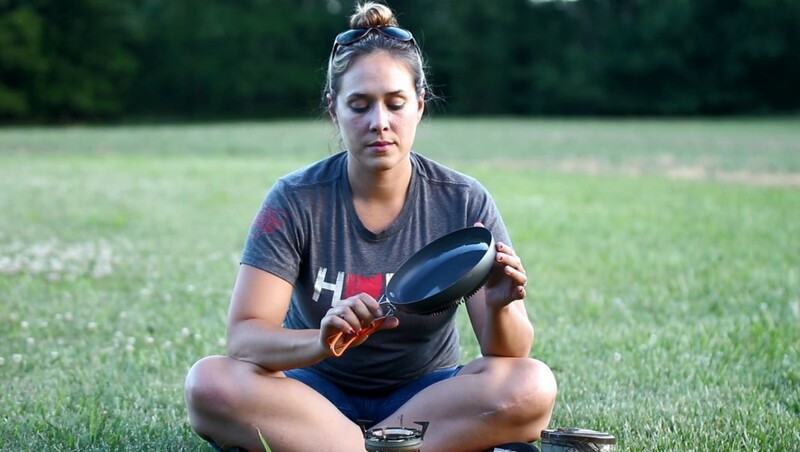 If you, like me, are all about eating better in the backcountry than you do at home, then this stove is also for you. The flux ring on the bottom of the pot (and optional pots and pans of various sizes) helps to pull heat to the edge of the dish delivering a more even heating surface. The new burner allows for an extremely fine control of flame output required for more delicate dishes. An included foldout tripod clips onto the bottom of the fuel canister increasing the unit’s stability by at least half a percent, if not more. The new Jetboil: boiling water for a morning brew, simmering stews, crisping crepes, and cooking a slab of cow to perfection are all now doable in one bodacious and compact cook system. Jetboil: Taste Freedom!